All, Just wanted to take a minute to share a short blurb about a man that has inspired me for my entire life and a project that he just completed for my daughter. My grandfather worked as a machinist for many years and in his retirement turned to doll house building ( my grandmother got sick of him tearing the house apart and rebuilding it.. lol) So after buying one of those kits he realized they were not worth it for the price. He has instead turned to building them out of scrap and other purchased wood. Everthing from the stairways, siding and even the shingles are handcut and glued into place. 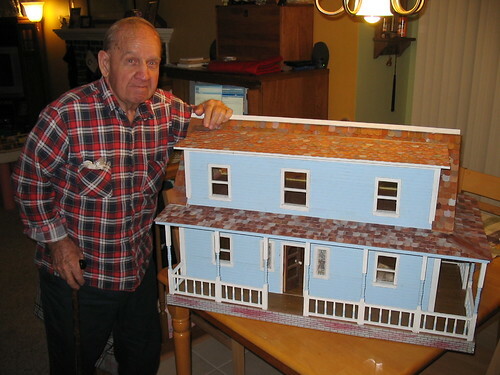 My wife and I visited him in August of 2005, he showed us a doll house that he was working on and informed us it was for his great-granddaughter, my wife became pregnant with our daughter that December and Sophia was born (somewhat on purpose) on my grandfathers 85th birthday. He is joining us for Christmas this year and brought up the finished doll house. The little bag that is inside is a special request by me. I asked him to make picture frames scale for the house that I plan to put not only his picture but other family members in so Sophia has them in her doll house for years to come. Perhaps I’ll post a pic of them later, he wound up making his own jig in order to cut and glue them. Thanks for reading, I am looking quite forward to having him here for Christmas. He was able to get down the basement and look at my shop and did approve, which made me very happy. I hope to aspire to have even half of his know-how. My second wife drug me to a doll house convention…kicking and screaming…I became amazed with some of the guys building small furniture and selling it for full price. This was before I was a woodworker. $1500.00 for a 7 inch high hutch. Now I know it takes just as many cuts and measurements as a full scale…still. This is a very special gift. Pretty neat Chris. I bet this Christmas will be very special. Your daughter has quite an heirloom. what a wonderful story and treasured doll house…. yes, I’d like to see the picture frames/pix. What a treasure for your daughter to have. I love the idea of family pictures in the dollhouse. Beautiful house and made with a purpose, what could be better. 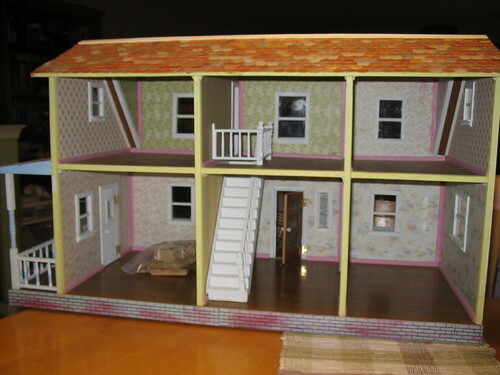 I’ll tell you Chris, doll house building can be addictive. I built about 30 before the Mrs. said it was too messy … furniture is okay though she says. Our love ones live on in our hearts.